Soldier attacked during operation to confiscate vehicles and money intended for the families of terrorists. During a Wednesday night operation in the hostile Dheisheh refugee camp near Bethlehem, IDF forces and Israel Police confiscated funds, cars and other vehicles intended for terrorists' families. Tens of thousands of shekels intended for terrorists' families were confiscated, together with several cars which would have been sold to provide money for terrorist families. 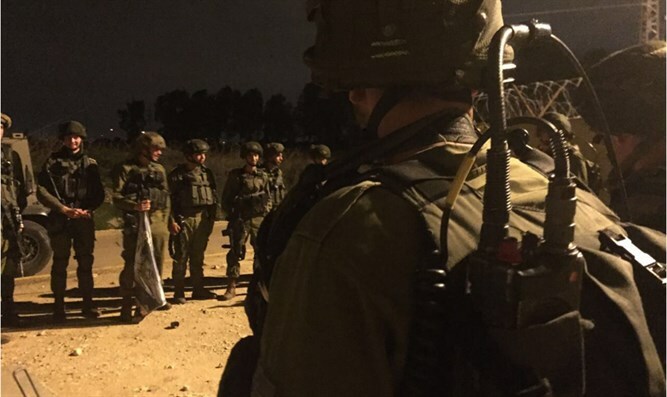 One IDF soldier was lightly injured in the operation by a rock-throwing Arab. The soldier was treated at the scene and transferred to the hospital. Near the Hevron-area Arab town of Kafr Yatta, IDF soldiers found thousands of shekels which were used to procure illegal weapons. The findings have been transferred to security forces. On Wednesday night, the IDF, Shin Bet (Israel Security Agency), Border Police, and Israel Police arrested eleven wanted terrorists in Judea and Samaria. Eight of these are suspected of involvement in "lone wolf" terror attacks, disrupting order, and violence towards civilians and security personnel.